Food is the cutest when it comes in mini form. 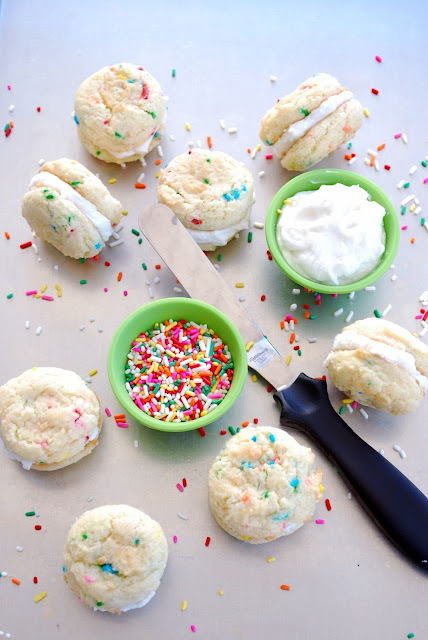 Take these mini funfetti cookie sandwiches for example. I mean, really. Tiny cookies. Frosting. Sprinkles. CUTE!!! I made these a while back for my daughter. She was going for her 4 year check up and I knew inoculations (we don't say "shots") were going to happen. She took them like a champ! I was very proud so I told her that I'd bake her up something special. Sprinkles = special occasion, right? In a large mixing bowl, add all the ingredients and mix well. Using a small cookie scoop (2 teaspoon size) drop equal amounts of cookie dough onto a parchment or silicone mat lined baking sheet. Bake for 10-12 minutes. Let cookies cool on cookie sheet for about 5 minutes and then remove to a cooling rack so they can cool completely. In a large mixing bowl, beat the shortening and powdered sugar until combined. Add the vanilla extract and water and beat on high for around 2 minutes, until the mixture is light and fluffy. Spread or pipe the filling onto the flat side of one completely cooled cookie and then top with another cookie. I made about 2 dozen sandwich cookies with this recipe. So cute! And mini means I can eat practically all of them at once, right? Love mini desserts too. So fun! Funfetti, mini, and frosting - those three words practically spell perfect. So cute and so delicious! Holy Cow! 1 cup of shortening and 5 cups of powdered sugar? Dang, that is about enough to kill you. mmm . . I love frosting made with shortening. It reminds of bakery frosting (which I love too). I know! I'm crazy about bakery frosting!!! I just stumbled across your blog and I absolutely love it! These cookie sandwiches are totally my thing. I can't wait to give them a try! Thanks so much Rachel!! I am crazy for cookie sandwiches too, like insane almost. Let me know if you try them! Such a cute idea to make cookies for your daughter when she has to get a shot. These look amazing! I love everything funfetti and these would be no exception! And the fact that they're cookie sandwiches?! Even better!